Happy Thursday!!! It's been a little while since I posted something but I felt the need to encourage you all today. Life can be extremely overwhelming and God can sometimes seem so distant but we must not give up! 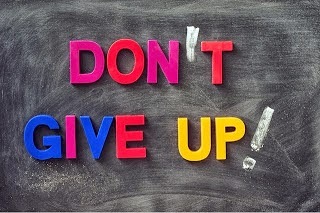 That's the encouragement for today...DON'T GIVE UP! Often times, our biggest blessing come immediately after our biggest trial. Keep trusting, keep believing, and watch God move on your behalf! Will it be easy? Nope! You will have to put forth the effort to remain hopeful...renewing your mind daily and declaring your victory but it's so worth it. YOU ARE WORTH IT! YOUR DESTINY IS WORTH IT! Keep pressing my friend...this too shall pass!